A big village-building card game in a small box. Villages Of Valeria is a card game that plays like a board game. Players gain access to resources to construct buildings and eventually use the building icons to enable the recruitment of adventurers. Both buildings and adventurers are worth victory points at the end of the game. On their turn, a player can take one of five actions. After each action by the active player all other players can then take the same action, but with less effectiveness than the active player. When a player takes the Harvest action they can add 3 building cards to their hand which can be taken from either the draw deck or any of the 5 face-up discard piles. Then, in turn order each other player can draw one card. Building cards provide either victory points and special ability when constructed or valuable resources. The Develop action allows a player to take a building card from their hand and place it in their player area to be used for its indicated resources. The cost is to discard another card from their hand. The follow action for the other players is that they will have to discard 2 cards in order to place a building card in their resource area. The Build action allows a player to construct a building into their village. The indicated cost must be paid by placing a gold coin from your supply on each resource needed to construct the building. Additionally, the player will get to draw one card to their hand. 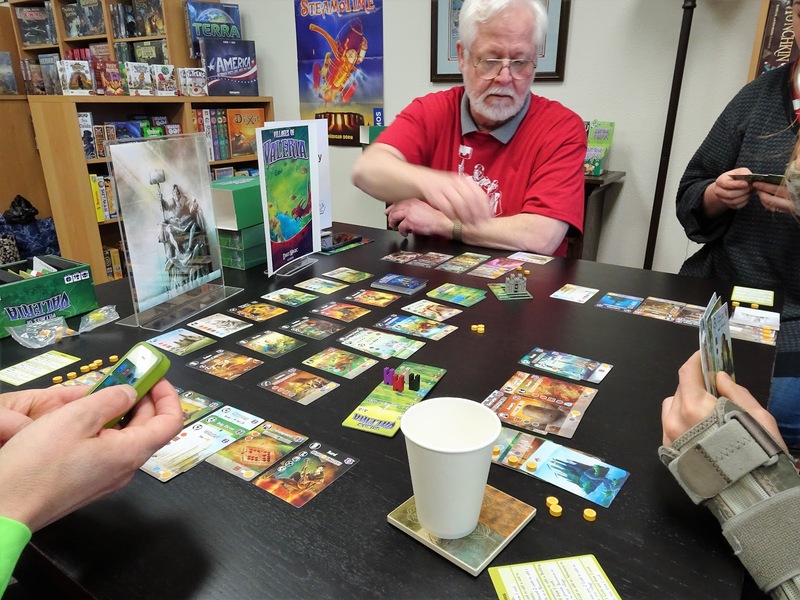 The follow action for the other players is to construct a building in the same manner but not draw a card. It is important to note that the gold spent to activate a resource during a build action (active or follow) must remain on that resource until the start of your next turn. At the start of your turn you gain back your spent gold and resources. The Recruit action allows a player to acquire one of the 5 face-up Adventurer cards. The indicated cost must be met by paying one gold coin to the bank and by having the corresponding icons on the buildings in their village. The follow action requires a payment of 2 gold coins and the required building icons. When a player needs to reload they can take the Tax action to gain one gold coin and to draw one card. The follow action provides the other players with one card draw. Every building and adventurer yields a combination sf special abilities and victory points. As soon as a player starts building they will acquire abilities to help them throughout the game. Things start to ramp up quickly and your head is always in the game because on every turn you can take the follow action. This game features great artwork, quick pacing, and tight game play with plenty of replayability. There are 84 building cards, 16 adventurers, and a deck of event cards to spice up the game after a few games have been played. This one is best described as a lot of game in a small package. 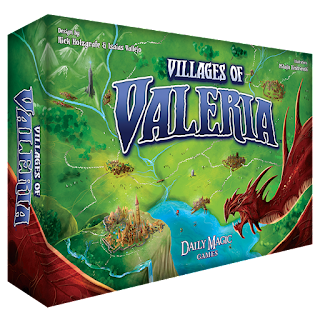 We have an open copy of Villages Of Valeria available in our Demo Games Library for you come in and try.